Fall seems to be one of the busiest times of year for families, with school starting for the kids, and all the holidays fast approaching, it seems near impossible to find some spare time. And when you have a pond, there are important maintenance steps you need to take before winter. So when your pressed for time what can you do to take care of your pond? Never fear, we have a few fall pond cleaning tips for all you busy people! In order for your pond to look like its well taken care of, like the photo above, follow these simple steps to start your fall pond cleaning. We find this to be a pretty important step that most people don’t follow. The net will catch most of the leaves and debris that may fall into your pond in the fall. If you do not net your pond in the fall, many of the leaves and debris will fall into your pond and end up at the bottom. Where they are not only harder to remove, but if left for long periods in your pond they will contribute to an excessive buildup of organic material. This can cause your pond to look…pretty unsightly. 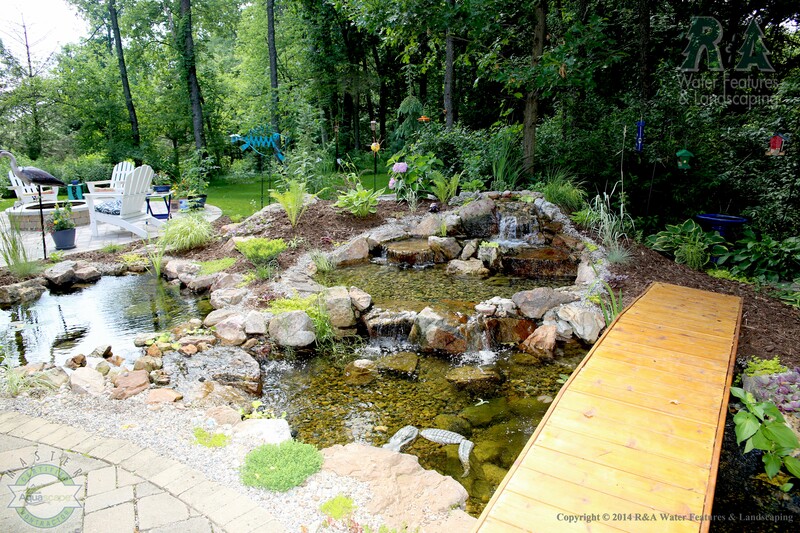 Trim back the plants in and on the water edge of your pond. If you have plants that have overgrown their pots, then dividing them is a must. If you have any tropical plants, now would be the time to bring them indoors. This is a pretty easy and straight forward part. Spray down the inside of the biofalls until the black plastic is showing, while spraying use a pump to remove the water. Remove the filter pad, this is the “eww” part. The filter pad is usually significantly dirtier than the biofalls. Spray the filter pad with the hose until it is clean. Also clean out the skimmer basket and rack. This takes the most time, this part includes draining of the pond and power washing all components (rocks, gravel, etc.). If you don’t have time for any of this, we will do all the hard work for you. We will net your pond, and come back after the leaves have fallen for a full fall pond cleaning along with filters, or only cleaning the BioFalls and skimmer. Prices start around $400 for a full pond cleaning and go up from there, all depending on the size of your pond.